Now you can have Missy the old “friend” of the Doctor in your home. 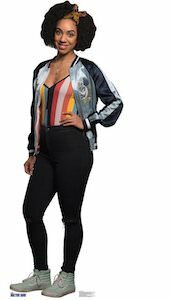 This cardboard cutout of Missy is a free standing poster that is life size (32 x 69 inch) and a great addition to your Doctor Who collection. Just imagine having a Doctor Who party and having Missy standing around. Or place her close to the window with Halloween and lets see if it scares the children away. Of course you have to be careful with having this time lord in your home as we still don’t completely understand what she is capable of.